Report of a vehicle break-in on Vancouver/Melrose. Our 2 vehicles were ransacked this morning at 115am – Vancouver/Melrose. Report of a vehicle break-in on Mountbatten Rd. Report of a snowblower being stolen out of a shed on Penetang St. This occured mid-day! Everyone please keep an eye out if a blue and grey 30 inch yardworks snowblower pops up. It was stolen midday right out of our shed. Report of a vehicle break-in on Crompton Dr.
FYI Crompton Drive area residents, be sure to lock car doors! I was really tired coming home last night and forgot to lock my doors(shame on me I know). Car was completely ransacked, luckily nothing missing- and nothing was left in there. Report of a chainsaw being stolen out of the back of a truck at the Wellington Plaza. If you come across anyone selling these please notify me. My friend is an arborist and SHE feeds her babies with these tools! Truck stolen from Johnson and Grove St. area. STOLEN FROM JOHNSON AND GROVE AREA. 2017 BLACK NISSAN FRONTIER 4 DOOR TRUCK. PLATE AD98535. All eyes on deck my friends. Report of vehicle break-in on Hickling Trail. This hit Hickling Trail Friday night. My neighbors car got broken into. 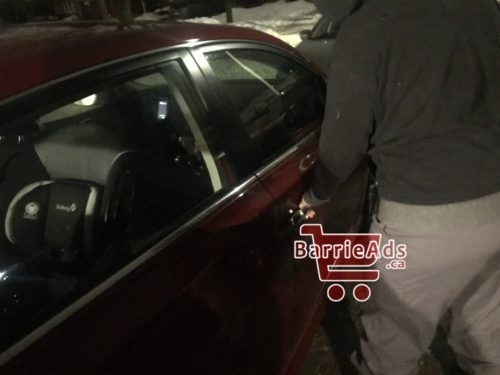 Report of a vehicle break-in on Steel St.
Report of vehicle break-in on Codrington St. They went through codrington as well! Between dundonald and st Vincent. Not sure what time though. Reports of vehicle break-ins on Varden Ave. This pair were out last night breaking into vehicles. Reported to police.Lock your doors! Reports of vehicle break-ins on Maitland Dr.
Just a heads up my car was broken into AGAIN last night 2nd time in a week .. Maitland Dr .. Johnson and Grove..
Tactical units and Barrie police apprehend suspect on Napier St. 👍🏻 Great job Barrie Police! Report of a car break-in on Johnson and Douglas St.
Reports of two vehicle break-ins near Cook and Steel St’s. Left our truck unlocked last night by accident , and of course someone went through it and left the door open a bit. Cook street near the college . My mom had her car broken into last night. It was locked. Home break-in attempt on Melrose Ave and College Cr. Friend on Melrose Ave posted this …..Woke up to someone trying our front door on Melrose Ave at 3 a.m. this morning, fresh tracks in snow showed the person went into our backyard and also tried our back door, patio door and basement windows…and then ran towards our neighbours… called police and the dispatcher said someone on College Cres had called shortly before when they woke to an intruder in their home…make sure your doors are locked! Report of a homeowner having 3 vehicles broken into on College Crescent. we woke up to find that all 3 of our cars were broken into over night last night .. our neighbours car was also broken in to.. our car was left open , thankfully we had nothing valuable left in our cars… just $15 in some change and an iPhone adapter was stolen (that we know of at the moment)…. just wanted to warn those who are in the area .. everyone lock your cars.. and whoever did this, and keeps doing this.. I hope you get caught and I hope you get what you deserve for going in to people cars and stealing items that these people work hard for ! Even tho they didn’t take anything valuable I’m still left feeling invaded and now a bit unsafe in a community where I thought I was safe..
Reports of break-ins on Johnson and Grove St. area. Reports of an attempted car break-in on William St. Someone tried to get into my vehicle around 4:45 this morning. William Street old Allendale. Multiple times every year. Reports of car break-ins in the St Vincent/Penetang St area. Last night my car got broken into near the St. Vincent/Penetang intersection, in our driveway. I saw something about someone breaking into cars on/near Grove st the last few nights. Probably the same slimy piece of sh*t.
Dont leave any valuables in your car, keep your eyes peeled. Reports of a male going through cars in the Grove St and Agnes St area. View photos here. WARNING! This creep is going through cars. AGAIN!!! Grove St / Agnes St area. Please pass along so we can catch this creep!!! He has a tool to get into locked vehicles!! Update: Same suspect seen on Grants Way doing the same thing. Hey everyone, these people were out last night checking windows to see if they were unlocked. It looked like they were unsuccessful.. I’m making this public so people can share! If you go to my profile the original video is where you can share. Reports of people going through yards in the Napier St area. Reports of vehicle break-ins on Bernick Dr.
Reports of car break-in near Anne St and Scott Cr. Reports of suspicious door to door activity (Carson Rd.) from a guy claiming to be from “Enbridge”. Reports of car break-ins on Ferndale and Livingston at 9:45pm ish. Reports of suspicious door to door on Madeline and Yonge. After 9pm on a Saturday? Mac’s convenience was robbed at 280 Dunlop St W.
• Camouflage style hoodie, dark coloured pants, blue/black checkered scarf, black with white Nike swoosh style shoes. More reports of suspicious “filter” salesmen near Mapleview Dr and Country Lane. ”it was about water filters he wanted to come in and look under our kitchen sink”. Once again, reports of suspicious door to door salesmen near Mapleton and Marsellus. The pitch was in regards to “water”. ”Happened to me today. I didn’t let him get 2 words in before I was telling him I wasn’t interested and was shutting the door. He then proceeded to tell me it was about my water and I said still not interested and shut the door. I could hear him say “Have a good f**king day then b**ch” on the other side. Mapleton and Marcellus”. Reports of suspicious door to door salesman on Gadwall Ave. The pitch was in regards to some type of filter. Reports of fake door to door water guy on Country Lane. More reports of fake Enbrige door to door canvassing in the Huitema Court Sub Division Behind the Holly Rec Centre. Reports suggest their saying “they are affiliated with Enbridge and need to check what kind of Plumbing we have in our residences something to do with our water quality”. Reports of suspicious door to door activity around Newton St and Gunn St. Suspects left in a black car. More reports of suspicious door to door activity near Wellington and Duckworth. They were asking questions into furnace filters and wanted to see the residences Bill. Report of a suspicious door to door dalesman on Kozlov St.
”He was adamant about me opening the door- pretending he couldn’t hear me- until I told him my husband is a cop. He heard that just fine!”. Reports of door to door scam on Carson Rd around 6:30pm. Man claimed to be from Enbridge and tried to gain access by asking to look at their furnace. Police were called. Reports of fake door to door “water guy” in the Essa and Mapleview area. He tried forcing his way into the home. Downtown Barrie convenience store was robbed. You can see more details here from the Barrie Police. Report of breakins at the Barrie public storage on Big Bay point. Multiple Storage lockers have been broken into. A male was assaulted by three individuals on Gregory Court near Carley Crescent. This happened in broad daylight. If you have information you should contact Barrie police. Truck break-in at Lake Crescent. The window was smashed and items imcluding a Stihl saw and Debit card was taken. The Debit card later being used at an Anne St gas station to buy cigarettes. Report of a theft of a snowmobile from Yonge Street and Lockhart Rd area. Anyone with information about this theft is asked to call South Simcoe Police Service at 705-436-2141, 905-775-3311 or Crime Stoppers at 1-800-222-8477(TIPS). 2 Reports of car break-ins on Grove St. One indicated that the suspect stated “he was looking for a cigarette”. Barrie police arrest suspect on Ambler Way after a keen citizen noticed an unknown male enter a vehicle. Reports of car break-ins in Innisfil at homes in the Yonge and Victoria Street west areas of Stroud. Reports of car break-Ins on Epsom Rd. Reports of vehicle break-ins on the corner of Duckworth and Napier St.
Reports of vehicle break-ins near Hickling park. Reports of attempted garage break-in on Ambler Bay. Reports of mail packages being stolen from the Ardagh/Ferndale area. Reports of car break-ins on Epsom rd. Be sure to lock 🔐 your vehicles! Reports of mail packages being taken around Ardagh and Ferndale. There are more reports of break-ins (Again) on Kinzie Lane. There are currently some reports of car break-ins in the Grove, Peel, Porter Crescent, Bayfield area and also around letitia heights. If you live in these areas make sure your doors are locked! More reports of vehicle break-ins on Kinzie Lane. Reports of car break-ins on Hickling Trail and Kinzie LN in Barrie. There are reports of break-ins on Kinzie Lane.